STENCILED INDIGO-DYED CLOTHING, SCARVES AND ACCESSORIES by Wen-Chun Tang (pictured) and Wan-Lee Chen, Taiwan. 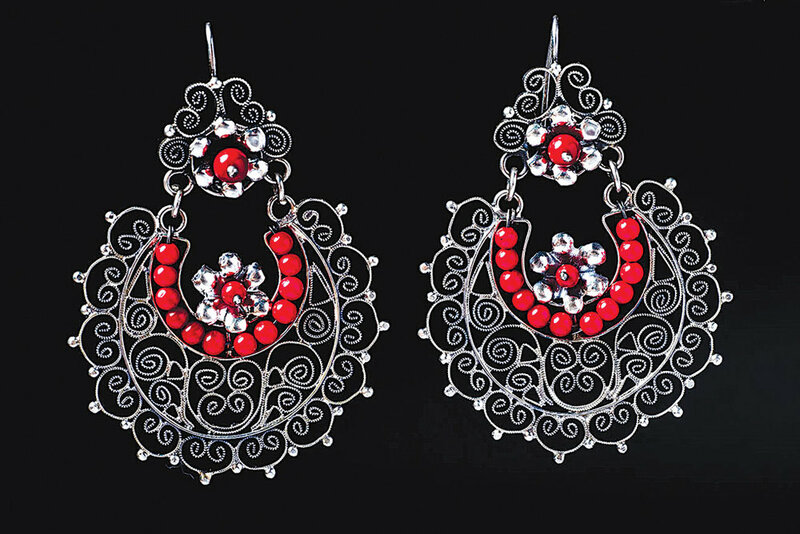 OAXACAN SILVER FILIGREE JEWELRY by Yesenia Yadira Salgado Téllez, Mexico. 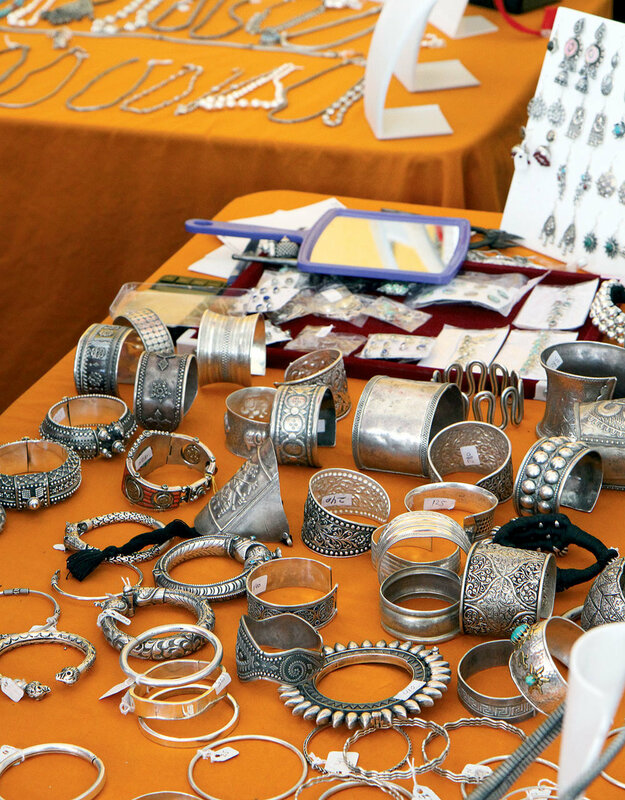 For fifteen years the International Folk Art Market (IFAM) has perched on Museum Hill, part of historic Santa Fe, a seductive, enchanting city in the Southwest’s high desert of New Mexico. Ninety-eight countries have participated in the annual July festival since its genesis in 2004; and the 2018 festival brought together fifty-three countries, two of them, Azerbaijan and Greece, for the first time. Originating as a counterpoint to our fiercely competitive, economically global world of corporate dominance, technical, mechanized and digital masteries, IFAM has become another kind of powerful voice, one that celebrates, encourages and supports the handmade. 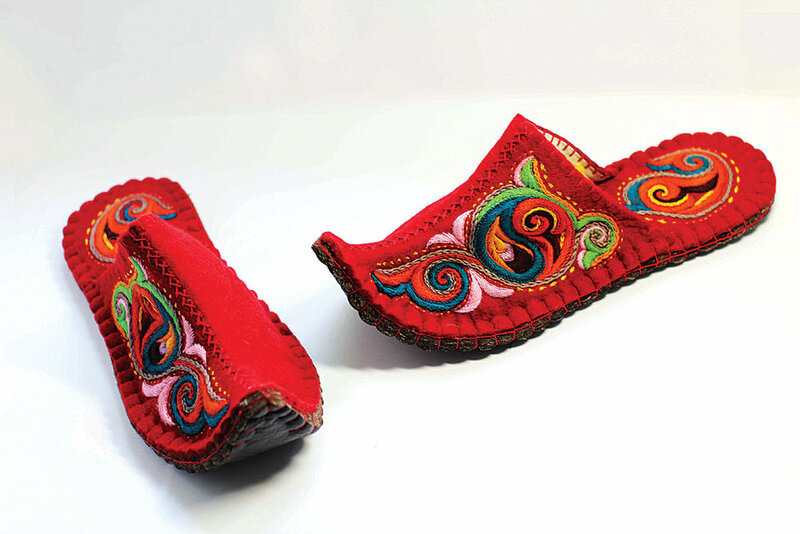 FELTED WOOL EMBROIDERED SLIPPERS by Gulzat Chytyrbaeva, Kyrgyzstan. 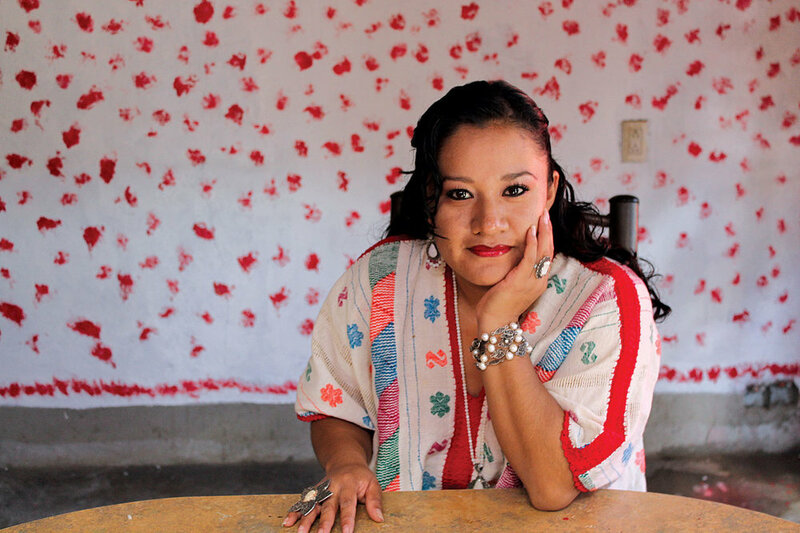 In Santa Cruz Xoxocotlan, just outside of Oaxaca City, Yesenia Yadira Salgado Téllez makes finely detailed handcrafted jewelry, specializing in the ornate filigree work introduced by the Spaniards centuries ago. 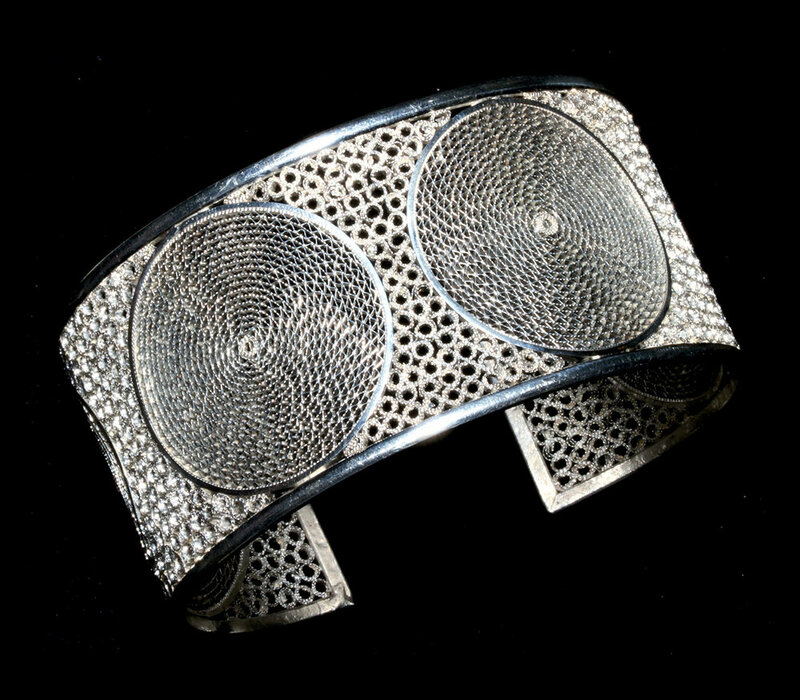 Her parents, goldsmiths Arturo and Marta Salgado Téllez, have been important mentors in her and her sisters lives, teaching them the exacting techniques and methods of jewelrymaking, such as the traditional “hoop” design replicated throughout Oaxaca. 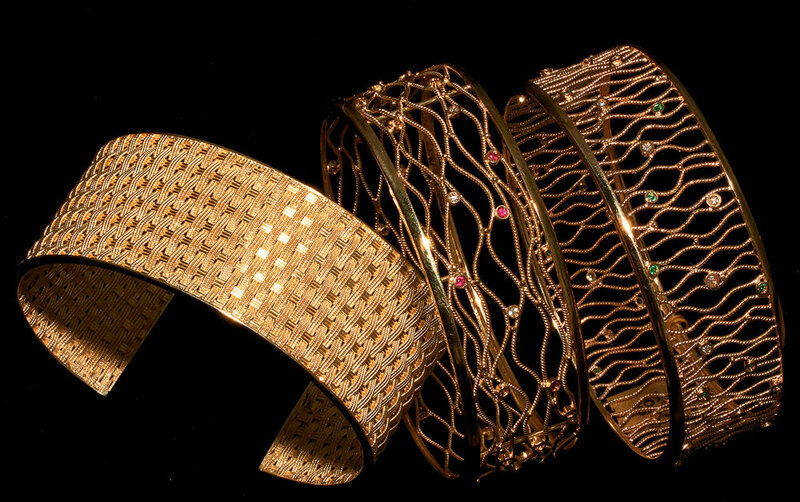 Now established in her own workshop, Téllez hones and increasingly introduces her own signature embellishments. She has gained more and more visibility in the craft world. 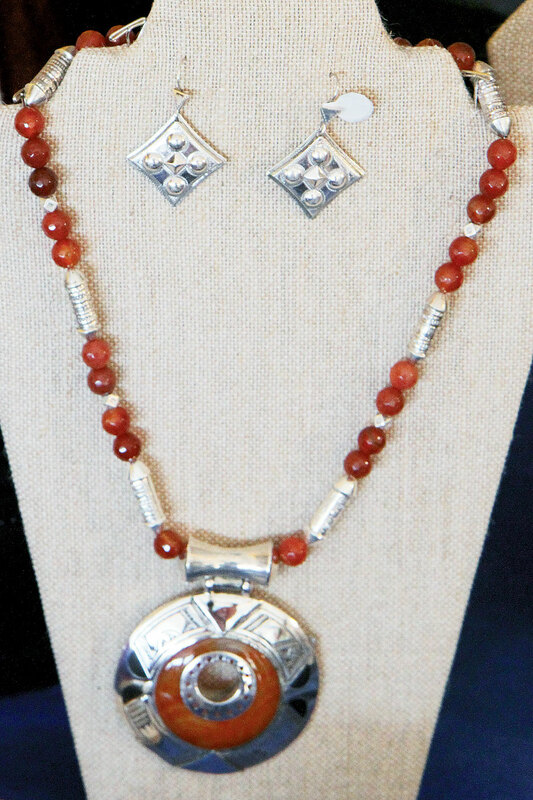 Along with her 2018 admission to the market, a first, and as a participant in the Competition for Young Artists, held in Oaxaca, she recently received an award for “The Hoop,” a gold-plated pendant and earrings accented with freshwater pearls, rubies and semiprecious stones. GREEN GLAZED CEREMONIAL WINE VESSELS, JUGS AND GOBLETS by Gyula Borsos, Hungary. One of six regions showing at IFAM is East Asia and the Pacific, with crafts from eight distinctive cultures—Cambodia, China, Indonesia, Lao PDR, Malaysia, South Korea, Taiwan, and Thailand. Their traditions draw on an infinite reservoir of thousands of years of making baskets, beadwork, ceramics, jewelry, and most of all, textiles. These participating countries cumulatively contribute to the overall mix and material texture that makes IFAM such a valuable and meaningful destination. 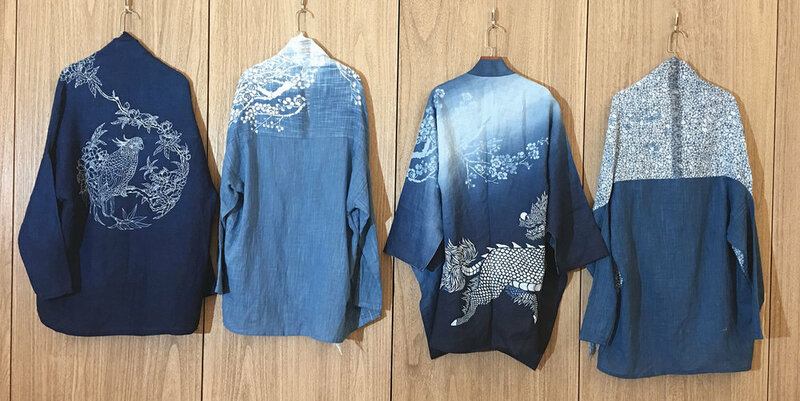 Two artists from Taiwan, Wan-Lee Chen and Wen-Chun Tang, specialize in sublime indigo-dyed garments, casual and wearable. While anchored in the traditional forms and motifs of their history, they also voice a relaxed, confident contemporary aesthetic, one that recognizes the global community as a source of inspiration. 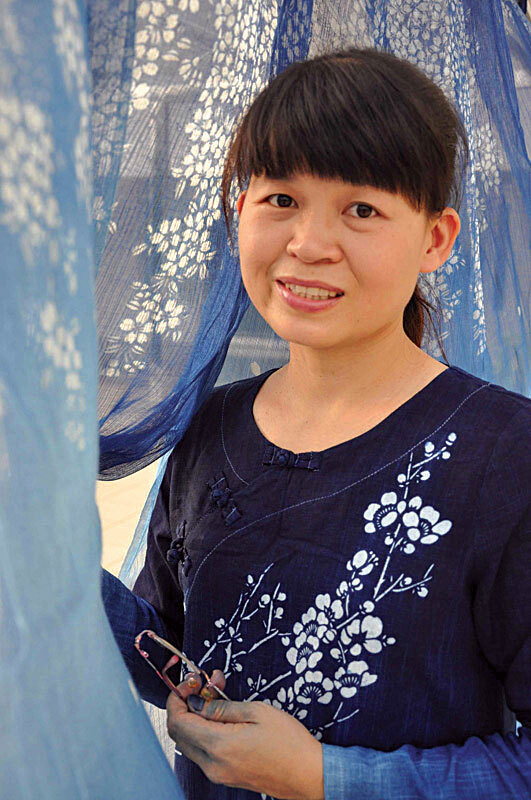 In addition to operating her own indigo farm and workshop, Tang is an indigo master dyer and teacher at the National Taiwan Craft Research Institution and her partner Wan-Lee Chen, a professor and designer of costume, received her Ph.D. from the University of Edinburgh in the United Kingdom. In its aspirations, the International Folk Art Market can be viewed through many lens, but one is the influential role the United States continues to play at home and abroad. 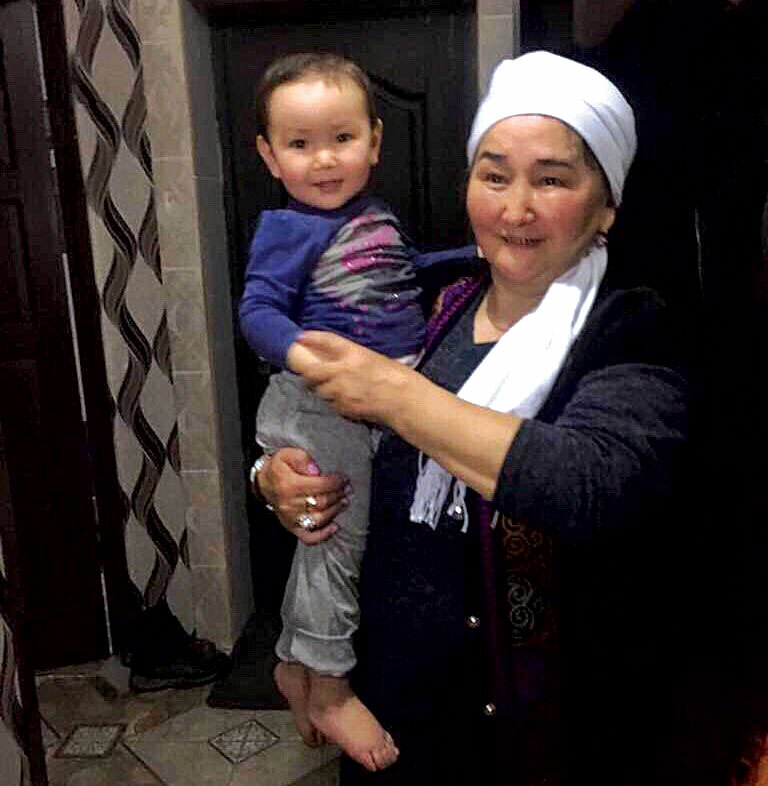 There are many differences and divisions keenly felt, and the struggle is strong and visible each and every day, but the US still sends a strong message of hope and possibility—and the world looks and listens, taking note. As individuals, there is common ground to be found in cooperation and compromise; and we can live together in peace and civility, respecting our humanity. 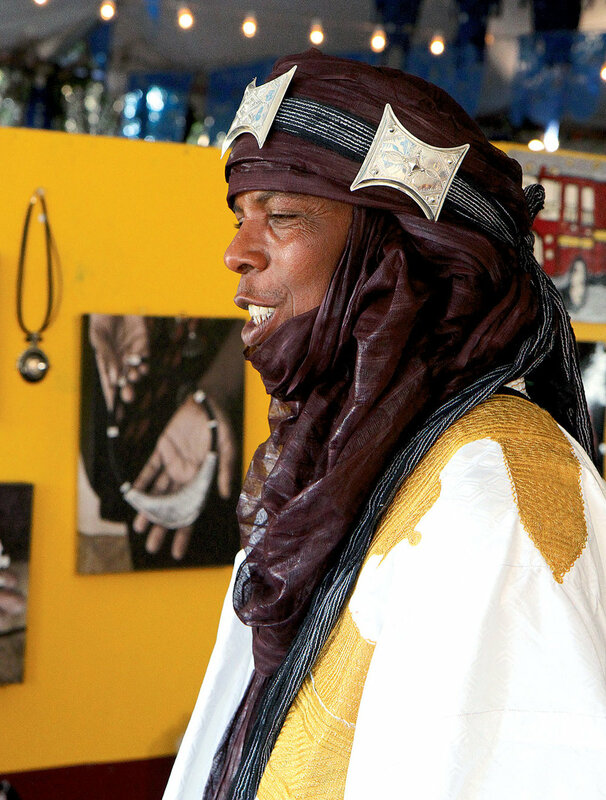 While the market honors the gifts of creation, bringing together artisans from all over the world, its true value is cultural—the world is a place for you and me to share and to exchange with each other, to grow and to learn. And for one weekend in July there are many such possibilities to be found on a certain hill in Santa Fe. IFAM next celebrates the global art of the handmade July 12 - 14, 2019. Visit their website at www.folkartmarket.org. IDA BAGUS ANOM SURYAWAN, mask carver from Mas Village in Bali, Indonesia. Photograph © by Marc Romanelli. If there was ever a riot of colors and sensations, rebelling against the staid bland urbanity of modern life, the International Folk Art Market, held annually in Santa Fe, New Mexico, would be it. Bringing together travelers from across the world, and pairing what is quintessentially local art with a meeting ground accessible by a global audience, this festival of human creativity is rather remarkable to say the least. Patrick R. Benesh-Liu is Associate Editor of Ornament and continues to find time to enjoy craft in between writing, travel and tech support. This April he attended the Smithsonian Craft Show, always a favorite, where he was part of a panel led by Craft in America producer Carol Sauvion discussing the state of craft in the twenty-first century. He contributes to the current issue an exploration of the International Folk Art Market in Santa Fe, New Mexico, a world bazaar if there ever was one. As Ornament’s reporter, he also provides a zesty compilation of the latest craft News, where you can find out what is happening with art-to-wear in the global neighborhood. COTTON HUIPIL woven by Florentina Lopez de Jesus, Mexico. Photograph © by John Bigelow Taylor. With breathtaking views of the Sangre de Cristo Mountains, for twelve years annually, Museum Hill in Santa Fe, New Mexico, has transformed itself into a colorful and lively outdoor world marketplace on Milner Plaza. 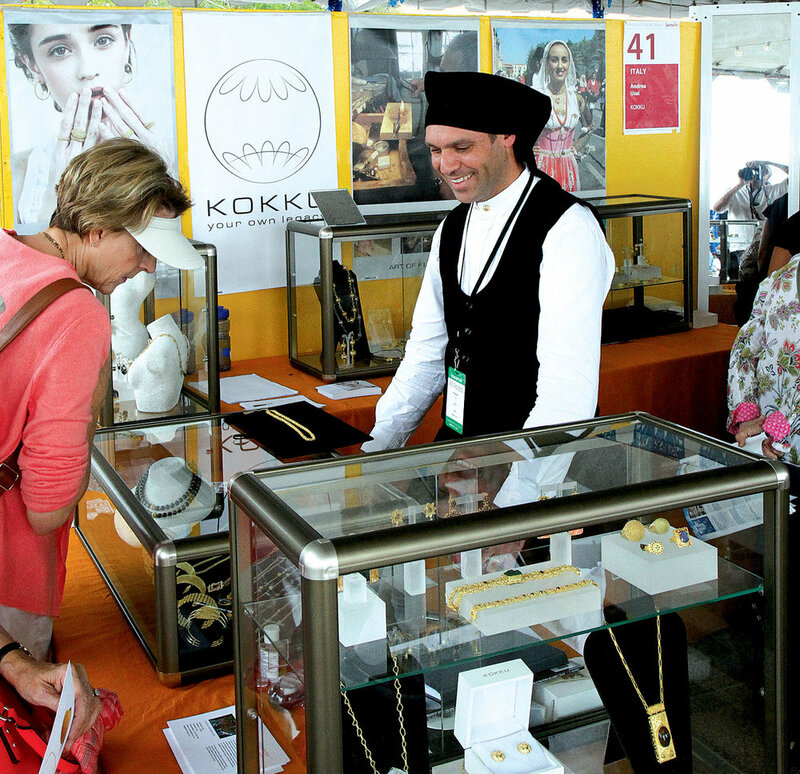 For 2015, some one hundred fifty artists from fifty-seven countries present their handmade crafts to an audience of over twenty thousand visitors. For one weekend in July, the plaza is a vibrant, even overwhelming commingling of artists and an audience eager to partake of the cultural bounty that personal exchanges like this make possible. There are plenty of children’s events, dancing, a food bazaar, films, and music, but it is the handmade that is the seductive draw, and rightly so. People are still eager to appreciate and perchance to buy the works of individual craftspeople. The United States itself over the last decades has experienced an upswelling of just such an interest in craft made by its contemporary artists. So much so that American corporations have in the last years cannibalized the word ‘craft’ and it is used to define everything from beer to cars. Companies recognized and quickly seized on a powerful zeitgeist of value and authenticity the word communicates. There is a hunger out in the land for that which is real and genuine, and culturally and materially, it now drives for-profit decisions without true attachment to craft’s deeper meanings throughout human history. 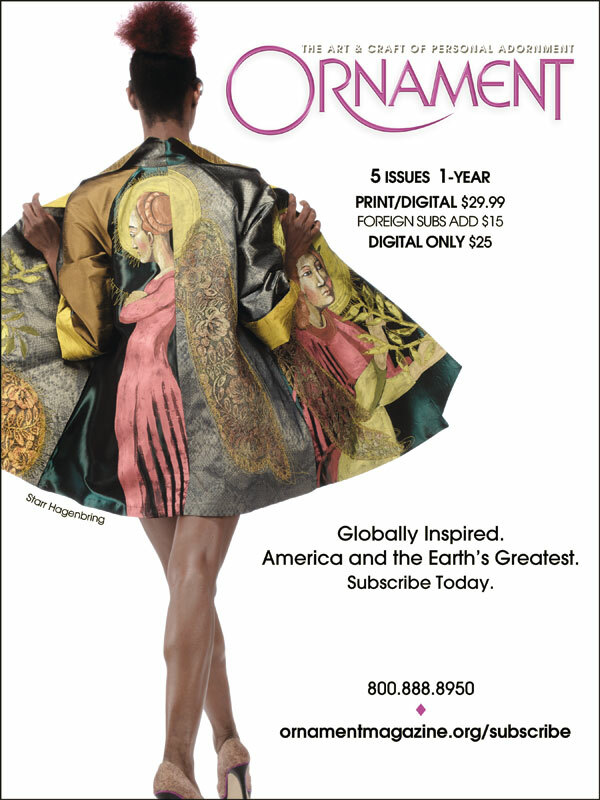 Carolyn L. E. Benesh is Coeditor of Ornament and the magazine’s resident expert on contemporary wearable art. 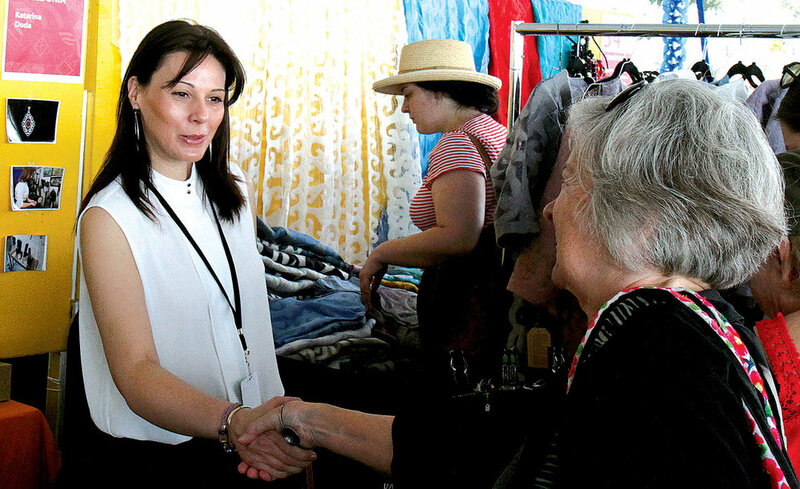 This issue she presents to the Ornament readership the International Folk Art Market, now celebrating its twelfth year in Santa Fe, New Mexico. 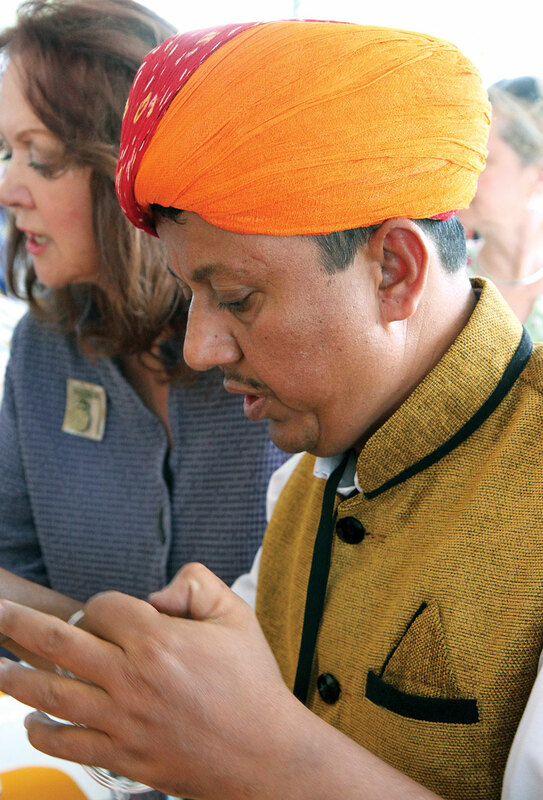 The Market takes place on Santa Fe’s Museum Hill each July with one hundred fifty master artists from around the globe showcasing their handcrafted work. She also, as always, gives her own personal take on the issue in Postscript.